You are a senior manager, administrative controller, manager or project manager, and you need to have a clear overview of your projects' progress and the amount of time worked by your teams and employees at all times. 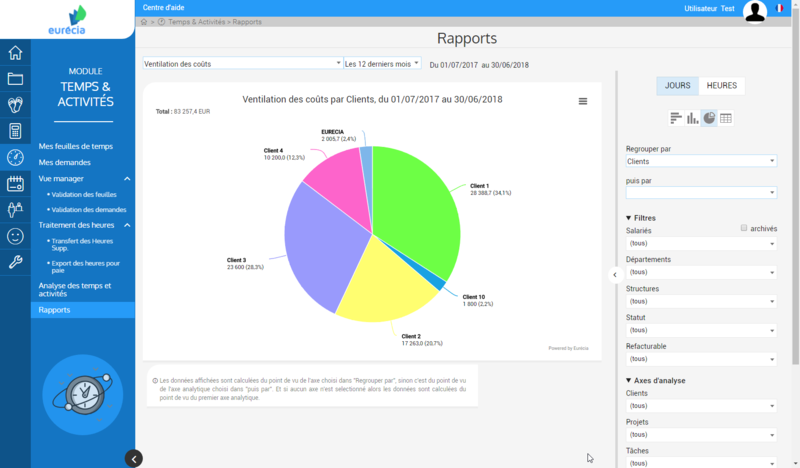 Eurécia's Timesheet/Time and activity management application simplifies and increases the reliability of the process for submitting employee timesheets or activity reports, in terms of time worked or activities. 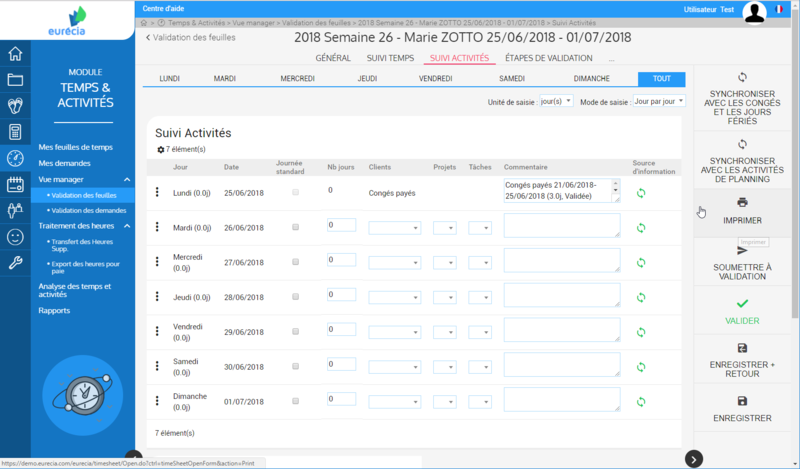 Eurécia calculates overtime automatically (the software is configured to comply with regulatory constraints relating to working time) and tracks the progress of projects in terms of budget and time spent. It also helps you keep better track of your margins. Finally, with just one click you can publish all the reports and dashboards you need to perform rigorous checks on project activities and profitability. Your teams will be able to quickly and easily input their work hours (configured based on their work shift calendars), view their hours as completed, and submit their timesheets to managers for approval (automatic email notifications are issued to both managers and employees). Managers or the HR department can then decide to export any overtime hours to the compensation days tracker that forms part of the Staff leave and absences management module. Employees can enter the amount of time they have worked (in hours or days) against cost accounts such as customer, project and task accounts. This makes it easier for management to track budgets (actual vs provisional) and calculate margins. Employees can also add, if necessary, activity reports, meeting minutes or any other relevant documents associated with their activities for the week. Prepare your pre-invoices with just one click. Eurécia's solution eliminates the risk of errors associated with the re-entry of data, by simply exporting data to your accounting department or any other system. Your managers and administrative controllers will have access, at all times, to an accurate and analytical overview of all your organization's activities... and their profitability!